The spine has three curves in it – one in the lower back called the lumbar curve, one in the upper to mid-back called the thoracic curve, and a curve in the neck called the cervical curve. These curves influence one another. If something is off-balance in one, the other two will also be out of balance. Since the spine rests on the pelvis, the curves of the spine are also influenced by the position of the pelvis. What happens when you arch your back too much? If the top of the pelvis is tilted forward (anterior tilt) the lumbar curve will be deepened—it’s more commonly called “arching your back” and, since the abdominal muscles are being underused, can make you look as though you have a bigger tummy than you really have. This also causes the other curves of the spine to deepen in response. When this happens, the individual vertebrae (bones that make up the spine) won’t be able to align with one another. Excessive anterior tilt (arching) creates stress where the pelvis and spine meet as well as stress in other joints of the spine. The top of the pelvis tilting forward also increases the stress on the hip joint. 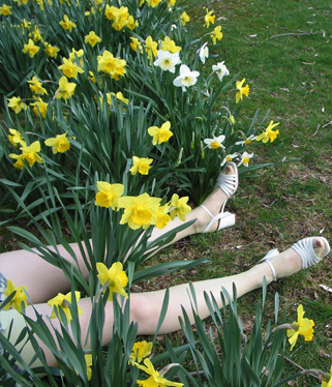 What happens when the pelvis is tucked under too much? 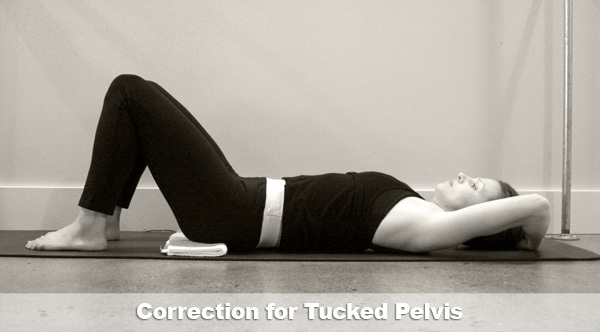 If the top of the pelvis is tilted back (tucked), the curve of the lower back is flattened. Since the curves of the spine are the body’s natural shock absorbers, when they are flattened, it limits the spine’s ability to absorb the forces it meets throughout daily life. Additionally, the flexibility of the hip joint is reduced and can decrease your overall mobility. Learning how the ideal alignment of your pelvis looks and especially how it feels, can profoundly affect the health of your spine as well as your general wellbeing. When your ASIS (anterior superior iliac spine—the bony landmarks on the front of your hip bones) and your pubic bone are on the same level, or same plane, your pelvis is in a neutral position in relation to your spine. A neutrally aligned pelvis allows the curves of the spine to operate in a balanced state with one another. This allows your spine to absorb the impact of the forces the body has to deal with in the activities associated with day-to-day life. But it’s not a position you want to stay fixed in constantly, or muscularly force yourself into. The pelvis is comprised of three bones and each has its own, individual moving rhythm. Don’t think of the pelvis as fixed, or a single solid structure. A neutral pelvic position is one you want to be able to find in your body and then, “…move from it, through it and back to it.” (Marie Jose Blom). And this is not meant to be a fixed state, but more like a dance that your pelvis moves through as you your body adapts and moves. Learning how to naturally maintain a neutral pelvis is important for the health of the body. Because no two bodies are exactly the same, one person’s ideal alignment is not going to look the same as another’s. Here is a general guide to help you find your ideal alignment both standing and lying down. Use a mirror for the standing assessment so you can see and feel your current pattern of alignment, as well as what your alignment feels like when your pelvis is in a neutral position. Stand sideways in front of a mirror with your feet hip distance apart and parallel. Find your ASIS on each of your pelvic bones and place the heel of each hand on them. Leave the heels of your hands on your ASIS and place your fingertips on your pubic bone. Look in the mirror to see if these three points are on the same plane. If the pubic bone is in front of the ASIS, notice how this causes the pelvis to tuck under. If the pubic bone is tipped behind the hip bones, notice how this causes a deeper curve in the low back (anterior tilt). Now line the the points up on the same plane. 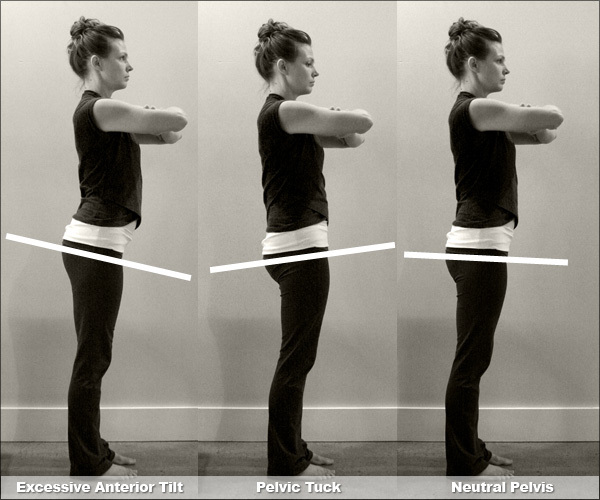 First, look in the mirror to see what it looks like to stand with the pelvis in a neutral position. Then close your eyes, while maintaining neutral, and allow yourself to feel what neutral feels like. Look to see if these three points are level. If the pubic bone is closer to the ceiling, your pelvis is in a more tucked position. If the hip bones are closer to the ceiling, your pelvis is in more of an anterior tilt and the curve of your lower back is deepened. If you have any questions about finding neutral pelvis or maintaining it while you’re doing Pilates, Melissa will be happy to answer them. Why not have a chat with her about it next time you’re in class. This article has been adapted from a piece featured on the Pilates Tonic website…from where the images too have been pilfered…yikes!…except the pic of Pelvis Presley which is by Iconcreations. Everyone knows the importance of good posture, but this doesn’t apply just to sitting, standing and moving around. 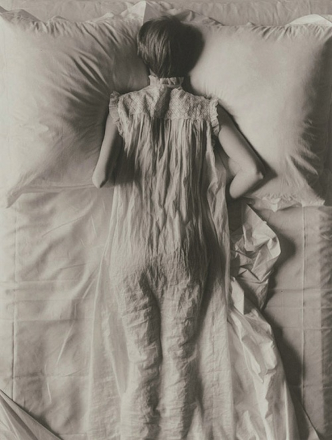 The muscles and ligaments of the body relax and heal themselves while we sleep. 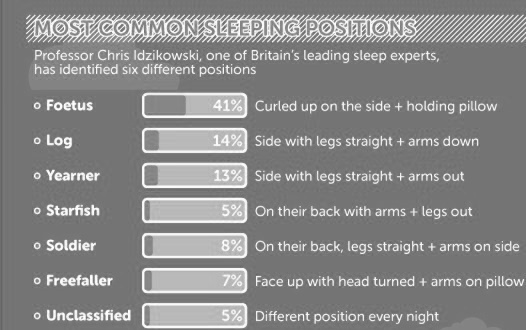 Given that we spend a significant proportion of each day asleep – the average Briton sleeps for 7 hours and 22 minutes (according to recent data from the alarm clock app, Sleep Cycle) – good posture when sleeping has a key role to play in maintaining the health of the body. 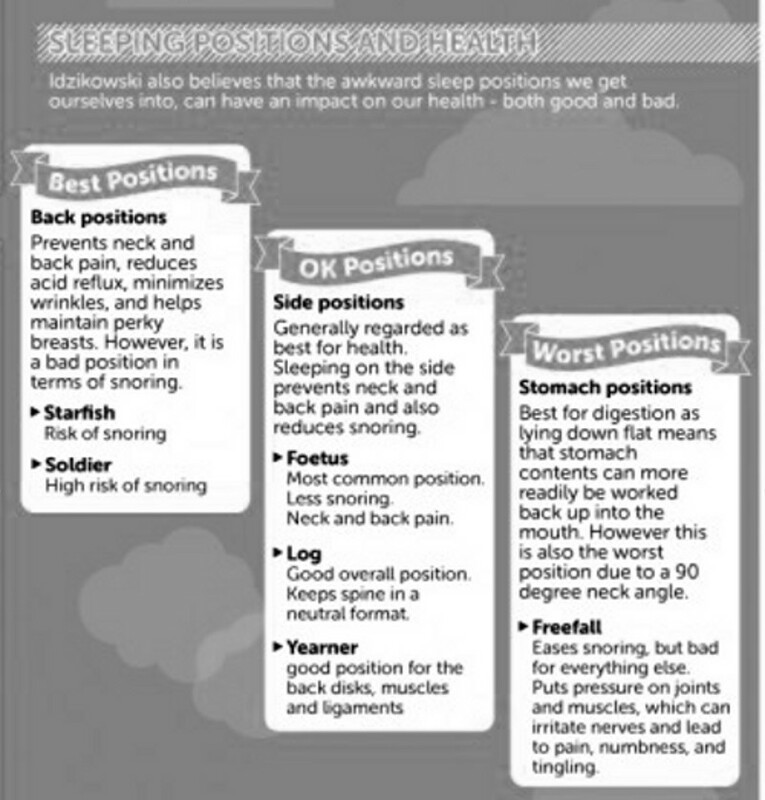 Which sleeping position is most like yours? Sleeping on your stomach can create stress on the back because the spine can be put out of position. 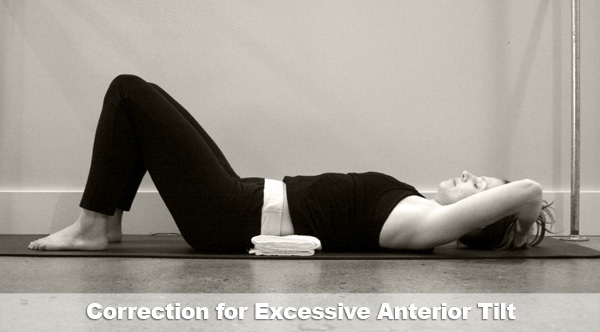 Placing a flat pillow under the stomach and pelvis area can help keep the spine in better alignment. 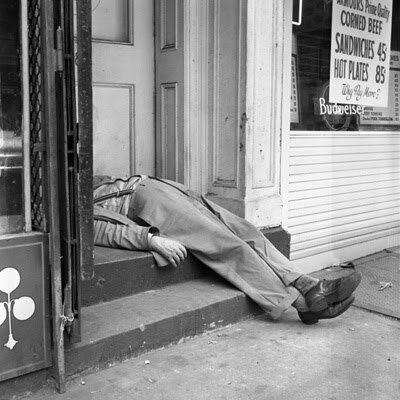 If you sleep on your stomach, a pillow for your head should be flat, or sleep without a pillow. Rest is an important part of a healthy lifestyle for all ages. It rejuvenates your body and mind, regulates your mood, and is linked to learning and memory function. Not getting enough rest, on the other hand, can negatively affect your mood, immune system, memory, and stress level. How good at resting are you? Why not take the Rest Test and find out. The Rest Test is designed to explore people’s attitudes and opinions towards rest and rest-related experiences. The reseachers want to take a snapshot of people’s resting habits. The Rest Test was designed by Hubbub, an international team of social scientists, psychologists, neuroscientists, artists, humanities scholars, and public engagement experts who are in residence at the Hub at Wellcome Collection in London. The questionnaire is split into two parts. The first part takes about 5-10 minutes. You will be asked some questions about your attitudes towards, and opinions of ‘rest’ and to give some demographic information. After completing Part 1 of the questionnaire you’ll be asked if you’d like to continue to Part 2 – there is no obligation to do both parts, but if you do have the time to do both that would be of great benefit to the researchers. Part 2 takes about 30-40 minutes and has more in-depth questions about rest and also some questions about yourself. By completing the test, not only will you help the researchers understand more about rest, you’ll also be given an instant summary of the results from the first part of survey, which will allow you to see how your responses compare to those who have taken the questionnaire so far. The results of the The Rest Test will be aired on BBC Radio 4’s All in the Mind programme in 2016. Here’s a link to the site where you can take the Rest Test. As you do with a hair, dental or other self-care appointment, make relaxation a priority by blocking out time for it in your diary. Taking this time is especially important when you are feeling stressed and over-burdened, even if all you do in that time is take a leisurely walk round the block. Rather than waking up and immediately jumping into the day at high-speed or equally jumping straight into bed at night, follow a routine that allows you time to transition from one part of the day to the next. For example, consider waking up 10 minutes earlier and before turning on your TV, radio, computer or smartphone, take the time to do some simple Pilates exercises instead. Relaxation isn’t only about resting your body—resting your mind is just as important. If you struggle with constantly worrying or stressing about certain concerns, write them down, put the list aside for a few days and then revisit them. Sometimes when we give our mind a break from certain thoughts, we return with greater clarity. Also, consider participating in an activity that requires your full attention, such as Pilates. This type of activity can give you a mental break by requiring you to be fully ‘in the moment’ both physically and mentally, leaving little time to think about your to-do list. 4. Try a relaxation technique. Sit or lie in a comfortable position. Put your hands on your abdomen and as you breathe in, let it expand like a balloon filling with air. As you exhale, slowly let the air out. You should feel your abdomen rising and falling as you breathe. Try to raise your shoulders up to your ears for 5 seconds, and then let your shoulders drop. Then, one at a time, rotate each shoulder backward 5 to 10 times, and then together rotate them forwards 5 to 10 times. In a relaxed position, close your eyes and breathe naturally. Think of the number one as you inhale. Continue this for at least five minutes but try for 10 to 20 minutes. Any time your mind starts to wander, gently pull it back to thinking of the number one.